"GOD SAID IT. I BELIEVE IT. THAT SETTLES IT." But we do. And there are a lot of ways we say this to people, even if we don't use that exact phrase. Think about that for even a second… It's weird, right? To some degree, this saying was designed specifically to end communication. So, while I've tackled worse Christian clichés before (1, 2), there is a part of me that still finds this one to be particularly odd. I can't say I really know where it came from or why... and maybe it originated with someone who had good intentions... but I still think that these sorts of phrases occupy a pretty ruthless place in our dialog. They are the kinds of things said by people who plug their ears, put up defensive walls, and declare that negotiations are over. When someone doesn't like the way a conversation is going but has to get the last word in anyway, he might trot out a cliché like this one. Or when a pastor wants to say "case closed" about some issue without building an actual case or owning up to the difficulty of confronting an issue in front of a congregation, the same sort of saying might be used. These are the kinds of things we communicate when all is lost and there's no point in even trying anymore. So sayings like this are dismissive... And dismissive is the last thing anyone looking to share Jesus should ever want to be. If you were an outsider hearing something like this, it would seem that Christians think they have nothing to gain from open discussion with you… How would that make you feel? And it’s not just something you might hear in actual dialog. Some Christians would advertise it to you from a distance - on their cars, their t-shirts, their Facebook walls - informing you in advance of any interaction (before you might dare to assume otherwise) that they are beyond having their opinion further informed or changed. I do think the attitude many Christians take toward scripture is unhealthy. And this seems especially true of Evangelicals. I believe our assumptions and certainties concerning what we think "the Bible says" are often getting in the way of our actually seeing Jesus in what we read. I think they even get in the way of us reading the Bible honestly, contextually, and holistically - despite the praise and reverence we lavish upon its pages. I am convinced that a lot of us are more interested in our ideas about this holy book than we are the person it's meant to be pointing us to. And I think Christian culture (and Christianese) bears witness to all these things I'm saying. There. Don't we all feel so much better? "You want to know what I believe? Read the Bible." "I just believe whatever's in this book." "The only theology we have is the Bible." "Our church just teaches the Bible." But here's the deal. However we might phrase it, this is a strange claim to make, because it assumes the one making it has a perfectly clear view of scripture, and a perfectly sound interpretation of it... which is, of course, incredibly silly. Consider this: You could easily find two people who believe entirely different things about some major theological issues - such as "sovereignty vs. free will" or "end times prophecy" or even “imputed righteousness and justification by faith" - and they could still BOTH claim they "just believe the Bible, word for word"... The point is, neither person would actually be making his/her own interpretation more valid or more established by doing so. Both people can claim they see what God said, and they believe it, and that it's all settled while believing entirely different things. So what is "settled" then? Perhaps not nearly as much as we thought. Today, even the people who've adjusted the saying to be, "God said it, and that settles it whether I believe it or not" are still making the assumption that they know for certain what "it" is... It's as though they think the only possible hurdle is our compliance with the truth, and not our perception of the truth. As if we don't have literally thousands of sects and denominations which prove that interpretation can vary widely - even amongst groups of people who all would say they believe in the Bible as an absolute authority. What might we be clinging to now? Which of our current broken systems and -isms have we ascribed to Jesus? Not only that, but Christians have a, shall we say, "rich" history of using scripture to serve their own agendas - which is the same problem Jesus pointed out in the Scribes and Pharisees. Historically, we've held many "biblical" opinions we later came to regret and change. Even as we've tried to cling to the past and dig in our heels, God has called us forward. So whether we're talking about the shift to cozying up with Empire under Constantine, or the many Crusades, or slavery, or manifest destiny and the genocides of native peoples, or the age of Imperialism, or women's rights, or segregation, or any of the other past mistakes Christians once literally held “Bible studies” in support of... you get the point. Christians have been on the wrong side of history plenty of times. And often it's the most vocal and well-regarded Christians of any given age who were in full support of these mistakes as a matter of following "what the Bible says". As Martin Luther once lamented, "The church twists the meanings of the scriptures in order to sell fraudulent visions of noble kings and kind rich men." That's a good way to put it. Though different periods of history have conjured up different sorts of “noble kings” and “kind rich men” for us to contend with, I think Martin was onto something. G.K. Chesterton was also onto something when he said, "Christendom has had a series of revolutions and in each one of them Christianity has died. Christianity has died many times and risen again; for it had a God who knew the way out of the grave.” Of course, whenever one of these deaths takes place, there are always plenty of people who stand around claiming doom and gloom over the process - desperately instilling their own fear in others by claiming there is some "secular agenda" at play, as though they believe there's a chance God might lose this thing... But despite all that, this process is both natural and beautiful. ...And it is taking place now. For however many people there are who remain afraid of the cycle of death and rebirth, there is also always a group of peculiar and prophetic people - those who challenge the evils of their time and call Christianity to greater things. So, while I used to say things like "I just believe the Bible" myself, I realize now that this is an overly-simplistic idea. I think it reflected more of my own insecurity at the time than it did anything else. It also reflected the all-too-common Christian practice of placing the greatest importance on the Bible rather than on Jesus. And it really doesn't make much sense if you think about it. It can't possibly provide much in the way of real illumination to other people, because it's literally the opposite of engaging in relationship and dialog. It is, rather, a disengaging. It shields us from having to honestly connect with other people where the complexities of faith and spiritual matters are concerned. Feeling exposed and vulnerable, we prop up a large book to act as a wall between "us" and "them" - to hide us from their scrutiny, and (let's be honest) our own, too... thinking it will make us appear stronger. More confident. Less naked. CLICK. Sometimes we find the greatest danger in the places we've taken refuge. And eventually, many of us can't even deceive ourselves anymore - no matter how many times we have shut down discussion or taken refuge in our faulty foundations. We come to see the reality that sayings like this one don't represent an open door, or a bridge, or an invitation... They represent a towering brick wall. They represent a gate shut in your face. Ultimately, when we say we "just believe the Bible", what we're really saying is that we just believe our interpretation of it. Our biases toward it. The lenses through which we view it... But our interpretations, biases and lenses? They're imperfect. Hopefully they're getting better, but they're still imperfect. And that's the delicate truth that doesn't make for cheap slogans or easy advertising. It doesn't play as well on Christian radio or TV. It's not sold as often from the pulpit, either. ...Perhaps we just need a new and more honest slogan? I believe God said it. That doesn't really settle anything. So no, you don't "just believe the Bible", and neither do I. This warmth is temporary. There was a better path to take. We should stop thinking we've achieved such a thing - or that it's even the most pressing goal to have - and start resting in something - or someone - who is a more sure foundation. You see, just as I pointed out in a previous entry, I don't share these things to encourage more rigid biblicism. I share them to say that our focus on rigid biblicism doesn't yield the results we think it does. Jesus said the Scribes and Pharisees had their heads buried in the scriptures all the time, and yet neglected the true gravity of the law in pursuing love and justice. In their rigid appreciation of and adherence to the scriptures, they had failed to recognize or come to him. And while they THOUGHT they had life in those texts, they didn't really. In fact, a lot of them had actually managed to find death in all of it. "A hallmark of fundamentalism: An inability to distinguish between authoritative text and fallible interpretation." I think that’s a pretty spot on analysis. When I've spoken with proud fundamentalists (and I used to be one), they have recoiled at being confronted on their claim to "just believe the Bible" for this very reason... They misunderstand the challenge. They confuse any questioning of their authority as interpreters as a questioning of the authority of scripture itself. You see, just because you believe the Bible is inspired and binding, that doesn't mean you can leap to the assumption that your interpretation of it is equally inspired and binding. And just because you say you believe the Bible is an absolute authority, that doesn't mean you've even made clear what you believe or why. You think you're declaring your fidelity to scripture in some absolute fashion, when in reality you're just making obvious how married you are to your own opinions. Like I said, I've been there. And it's the mindset I see across much of the Christian landscape. It's evident in how staunchly I see Christians clinging to long-held ideas without a willingness to revisit and re-establish them. You know what you don't hear very often? Whether from pulpits, or just in regular conversation with strict biblicists? Something like this: "I was reading what Jesus says here, and it changed the way I see everything." Or, "I realized that I've been wrong about this my whole time as a Christian." Or, "I didn't even know the Bible SAID this until this week!" It's amazing we don't hear much of that, since studies show that most Christians are biblically illiterate... But these are the same people who say they "just believe the Bible..." So what we have going on around us is a situation in which people equate CLAIMING "God said it / I believe it / That settles it" with their actually KNOWING what the Bible says - their actually UNDERSTANDING and DIGESTING it fully. It becomes clear that Christians see "believing the Bible" as a position they take rather than a process they undergo. We make a great show of maintaining that scripture challenges us each week, but so much more often, scripture is only used in a way which further entrenches us in our opinions. Our church services bear witness to this: Sermons dispense the preconception, theme, or topic of the week, and then the Bible is brought in merely to confirm it. The Bible is, in these cases, more of a proof-text for things we already believe or hold to be true... Of course, if that's the way you "just believe the Bible", you can easily make the Bible say anything you want it to say. Even when people do claim to have found something new in scripture, you will notice it almost inevitably leads to them gripping their previous ideas all the more tightly. It is not genuinely new, but the old thing from a new place which seems to confirm a previous bias. Anyway, just because someone uses a few verses to make you feel guilty over well-worn topics of Christian cultural concern doesn't mean it was truly scripture which challenged you. Walking the "straight and narrow", for us, has been framed entirely in the act of walking, and thus has not been framed in the revolutionizing of how we even define what the straight and narrow is. Let me unpack the idea above for a moment. Keep it in mind and stick with me on this. We can tell that "repentance" is a huge deal at the beginning of the New Testament, as seen in what Jesus and John the Baptist have to say right off the bat. "Repent!" The Greek word behind it is metanoia, and the English words "repent" or "repentance?" ...It turns out they're not good translations of that Greek word! In fact, many scholars would go so far to say they are "utter mistranslations" of the original Greek, and many have been saying so for centuries. This Greek term is a composite one - built of two words. Meta is the Greek for "after, with, and behind." Noia refers to "perceiving and understanding with the mind." We still use meta in forming words to this day. One example: In the Information Age, we collect “metadata,” which is data ABOUT data. The kind of data which only a broad spectrum analysis and scope can illuminate after the fact. The kind of insight only hindsight can provide. It is data which only has its use and application along with other data. And we use meta similarly with many other English words as well. It describes the RELATIONSHIP we have with whatever it's attached to. Metanarrative. Metaphysics. Metamorphosis. Metanoia, then, is as Edward J. Anton points out, a "cosmic shift." It is a "transfiguration for your brain," illuminating a world that was never before possible. It is not looking back in sorrow or guilt, but looking forward to a different sort of future. It is not coming to grasp how pathetically terrible you are, but rather, as Peter Senge notes, coming "to grasp the deeper meaning of learning" itself. So the problem is this: In English, when we say "repent," we're usually referring to "feeling guilt or regret at what we've done, and being sorry about it," and perhaps even "going another direction," but metanoia actually means "changing your mind entirely, and having your way of thinking and perceiving revolutionized." — "Repent! For the kingdom of heaven is at hand." Adjusting terms and unwrapping concepts... OR... Why the New Testament should read less like a stuffy religious text, and more like the pamphlets circulating during a Revolution. The mistranslation and misunderstanding of this one Greek word explains a lot. It has been a revolutionary experience to continue working out the implications of that shift in perspective. It's images like this that are the reason people say "a picture is worth a thousand words." While pastors, authors and leaders continue to carry a message of "Repent!" with great passion and conviction, far too often that message is not a reflection of the Jesus they are trying to identify it with. This is how we have a church culture which can bring about such dramatic "repentance" in people who have never come to a real place of metanoia in order to find their way into Christianity. Culture had already defined for them what it all means and how best to follow it. Thus, we have lost the virtue of metanoia. The very concept of it - and its fundamentally subversive nature - is not a big part of modern Christianity, despite being THE clarion call of the New Testament... Let that sink in a second. Just breathe, and let that sink in. To put it as simply as is possible... We have replaced "See everything with new eyes" with "Use your old eyes, but just commit yourself to follow the rules better this time." But true metanoia is release from those things. It is liberty. It is the deep and abiding sense of the way forward as we let go of the former entanglements we never even realized were holding us back. It is brand new eyes and a brand new mind. It is revolution. A lot of us never find that revolution. "The Bible" as they know it. A lot of Christians need to be rescued from the way they perceive, read, understand and use the Bible. Their level of reverence for the book itself has amounted to them looking much like the ewoks in their attempts to worship C-3PO in Return of the Jedi. However pious and passionate they might be... they aren't really listening. They aren't truly understanding. Their biases have served to elevate them and their perspectives rather than illuminating a more ultimate perspective. They have served to obscure a lot of meaning and truth rather than unveiling it. They are not honoring the object of their affection so much as they are honoring their assumptions - the lenses through which they view everything. I have said this before and I will likely say it again: It's very easy to claim we pay attention to things like context, the original languages, poetic form, the literary devices of specific cultures, etc... but it's much more difficult to actually observe and value those things in practice. The truth is, even in the most staunchly "Bible-believing" churches, we're more prone to visiting our modern biases on the Bible than we are to actually getting into the MIND of the scriptures and the soil from which they grew. Many of us are charged to read the Bible literally by people who don't bother to read it literarily first. A bubble, however "Christian", is still a bubble, after all. And, so long as that continues to be the way of things, it's not really the Bible we are so passionately "believing" in. More accurately, it's our own structures and traditions we're championing, as those things prove themselves to be the foundation we're far more invested in preserving. As Jesus said to the Scribes and Pharisees, "You have a calculated way of evading what God has to say in order to cling to your own traditions." These were the same people holding so desperately to "the Bible" as they knew it. The same people hoping to be defined entirely by it. The same people claiming to be in full support of all it had to say... their noses buried deep within its pages, and their mouths repeating its words... all the time. For them, it was all set in stone. All of it was... "settled." We must - at the very least - be open to the possibility that we might be doing the same thing still, over many potential issues and ideas. We must learn to walk humbly in regards to our interpretations and assumptions, and not confuse them with our core faith in the Person of Jesus. We must accept that our opinions of the Bible are not perfectly objective, nor will they ever be. The Living Logos is the Word, and the Word was made flesh, not text. We must remind ourselves that truth is a process we are in and not a position we take, like some box we can check on a form. For we are here to truly live - to meaningfully engage our moment of history in real and dynamic relationship to truth and beauty. We are from the future. With that comes the responsibility to herald the great dimensional shift which is permeating the universe. We're not simply maintaining the old, but perceiving the new... Even (and especially) if it changes everything. 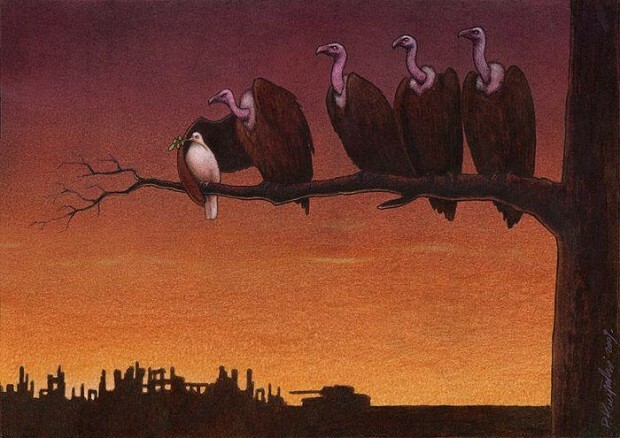 to Pawel Kuczynski, a brilliant illustrator from Poland. Such a resonant soul. You can see more of his work (and order actual prints!) at his website.